The Home Affordable Refinance Program has been an answer to prayers for millions of Americans that were left with underwater mortgages. Now you can compare HARP loan rates that offer a unique government refinance plan available to people with underwater loans for a limited time. The US government passed a massive economic stimulus programs that created the Home Affordable Refinance Program to help homeowners refinance, even if they had no equity. Many borrowers lost their equity and until now there have been no refinance programs that waived the equity requirement in underwriting. The good news is that more people are getting approved for affordable home refinancing more than ever before. Get help understanding the new HARP requirements and verify your eligibility at no charge. Obama Extends the HARP Mortgage Program: The President announced that the Home Affordable Refinance Program would be extended for an additional 18 months through 2016. The HARP refinance guidelines have been lightened significantly as there is now NO LTV limit. Prior to the Obama refinance changes, borrowers were limited to 125% refinancing, but with the new program HARP lenders will have no equity restrictions in an effort to help as many people stuck in an underwater mortgage. Most of our participating HARP lenders process a high volume of loans under the Home Affordable Refinance Program so you won't have to worry about tying up your loan for 60 or 90 days. Our HARP lenders close loans within 20 to 35 days in most cases. Check out the HARP loan rates and the HARP Program to borrowers who are upside down with respect to their loans and property value. Get more info today with cost-effective solutions under the Home Affordable Refinance. For the most part, loans under the Home Affordable Refinance Plan have low mortgage rates. In most cases qualified borrowers might pay only .125% higher of an interest rate under the Home Affordable Refinance Program. HARP rates are starting at 3.25% (10/20/15). 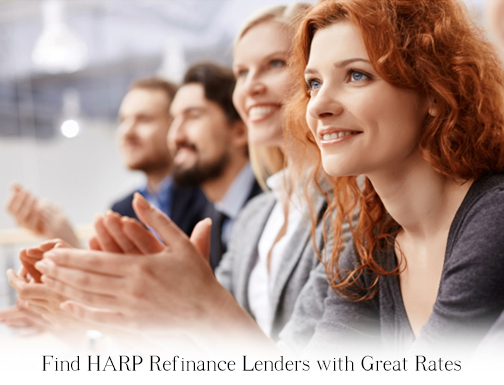 There are reduced and no cost HARP loan opportunities for qualified applicants. People looking to compare no equity refinance options should act fast because this underwater mortgage program will not be around much longer. The HARP rules have been eased once again and many homeowners have found a real solution with these Obama loans. The HARP loan requirements have are not as stringent anymore and as a result more people have become eligible for the HARP program. Unlike to 125 loan for debt consolidation the new 125 mortgage is the Obama mortgage that is offered to borrowers who have a Fannie Mae or Freddie Mac mortgage that is not greater than $417,000. However, the HARP 2.0 now has no loan to value requirements. That means borrowers can actually refinance beyond 125%. The HARP is the loan vehicle of choice for people who lack equity but want the best first mortgage refinance available. Initially the "Home Affordable Refinance" was a 125% mortgage provided from government bailout funds in the recently passed Obama stimulus bill. We connect applicants with offer multiple refinance offers from trusted companies that endorse the "no equity" requirements outlined in the HARP plan. The latest version of the affordable home refinance offers more aggressive guidelines as now there will be no loan to value restrictions. Ask the HARP mortgage lenders at Nationwide for more details about these amazing upside-down loans that are helping borrowers save the homes of thousands of Americans. Credit score requirements range from 620-800 depending upon disposable income, debt to income ratios and job stability. Refinance your first mortgage into a low fixed rate. 125 Mortgage guidelines have changed, but new government mortgage relief is available with the Home Affordable Refinance Plans that enables borrowers to refinance their mortgage even if the mortgage is greater than their home's value. How does a fixed rate compare to a variable? Consider traditional and interest only payments when refinancing your house. Use this calculator to figure out a payment that meets your budget and comfort level. If you are nervous about taking on an adjustable rate mortgage, then we strongly recommend you choose an affordable fixed rate mortgage so you can sleep at night. The HARP refinance program has already helped thousands of homeowners that were considered upside-down with their "loan to value". According to Reuters, Obama and the FHFA removed the LTV restrictions that were previously capped at 125%. Please make sure that your 1st mortgage lien is owned by Freddie Mac or Fannie Mae, otherwise you will not be eligible for the Home Affordable Refinance. Check your HARP eligibility now with no fee or obligation. Homeowners Still Saving with the Home Affordable Program - HARP mortgage applications spiked dramatically in 2016. This equated to 180,572 Obama loans under the HARP refinance product. How do you know if your loan is owned by Freddie Mac? Visit this link to find out if your mortgage meets the Freddie Mac/ HARP requirements. Get the latest about the Obama refinance program. HARP Refinance with a 2nd Mortgage? - Yes the HARP 2.0 allows 2nd lenders to subordinate their equity loans and credit lines. Please be aware that this is not an advertisement for credit. Nothing on this site contains an offer to make a specific home loan for any purpose with any specific terms. BDNationwideMortgage.com has no affiliation with HARP or any government entity. This is a web-site and no mortgage can be guaranteed as HARP loan rates and refinance requirements are subject to change. Copyright © 2001-2016 and beyond, Nationwide Mortgage Loans, BDnationwidemortgage.com. All rights reserved. Do not duplicate in any form.